Sure piranhas are scary, but the Goliath Tiger Fish makes the Amazonian native seem like a gold fish. "The goliath tigerfish makes its home in the Congo River system in Africa. The toothy, scary-looking creature looks more myth than reality and seems fit for the movie screen. 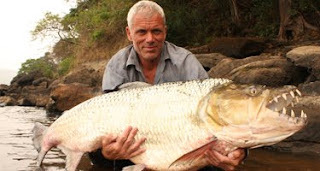 The goliath tigerfish is considered Africa’s equivalent of the South American piranha. The goliath tigerfish packs 32 razor-sharp teeth that can tear through even a solid steel wire. It has been ranked by “In Fisherman” magazine as one of the top 10 hardest-fighting freshwater fish on our planet. The fish has the scientific name of Hydrocynus Goliath and they can measure up to 2 meters in length and weigh up to 50 kg." Check out the Weekly World News for the rest of the article and a video about the Goliath Tiger Fish. Did you see the record catfish last week?